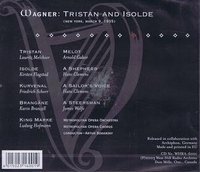 "When first heard on 6 February (just four days after her début) Flagstad’s Isolde had caused a sensation. We can closely approximate that experience since the broadcast of 9 March [above] is Flagstad’s very next appearance in that role. Melchior’s knight is already familiar to the radio audience, but the 1935 broadcast provides our first opportunity to hear him in a complete Wagnerian role. The sense of discovery may therefore be nearly as great in regard to the Danish tenor as for the new Norwegian soprano; in fact, this proves to be the case." “Lauritz Melchior trained with retired Danish tenor Vilhelm Herold. In 1918, now singing as a tenor, Melchior gave his first performance as Tannhäuser. 1924 saw his first performances at Bayreuth (Siegmund, Parsifal), and at Covent Garden (Siegmund), two of the most important theaters of his career. Another crucial debut came in 1926: the Metropolitan Opera, portraying Tannhäuser. The remainder of the 1920s passed by in a whirlwind of newness. Although in the 1920s Melchior was planning to make Germany the center of his career, the unforeseen Nazification and Great Depression of the early 1930s in fact moved him away from that country's theaters, including ‘Hitler's Bayreuth’. After 1933, the majority of his opera season was spent at the Metropolitan. It was a Dionysiac time for Wagner performance. His only new operatic role in the 1930s was Florestan. Melchior left the Met and the opera after a much publicized kafuffle with incoming General Manager Rudolf Bing, giving his last performance (Lohengrin) in February of 1950."